The inspiration behind GEM came last summer when I experienced a breadth of health issues battling severe inflammation, hormonal imbalances, acne and fatigue. After countless blood tests and allergy tests, I simply found I wasn’t getting the nutrition I needed because despite eating well, I learned our food system today is broken; starved of its nutrient diversity and density. Ironically, by avoiding the center aisle of fortified, enriched processed foods and additional supplementation in my diet, it was nearly impossible for me to get all the nutrients I needed. Yet when I turned to the supplement aisle to fill the gaps in my diet, I was met with only highly processed options that did more harm than good – capsules and pills filled with questionable additives, synthetic fillers, artificial binders, and toxic junk. So I set out to challenge the conventional notion of the vitamin altogether and create an entirely new kind of daily health solution. One made real, and designed with all women in mind, including Mother Earth. Beauty is about being confident in your own skin, from the inside-out. My beauty rituals are simple: the right nourishment, sleep, and water. To get my daily dose of beauty nutrients, I always make sure to take one bite of GEM, often in the morning with a full glass of water. 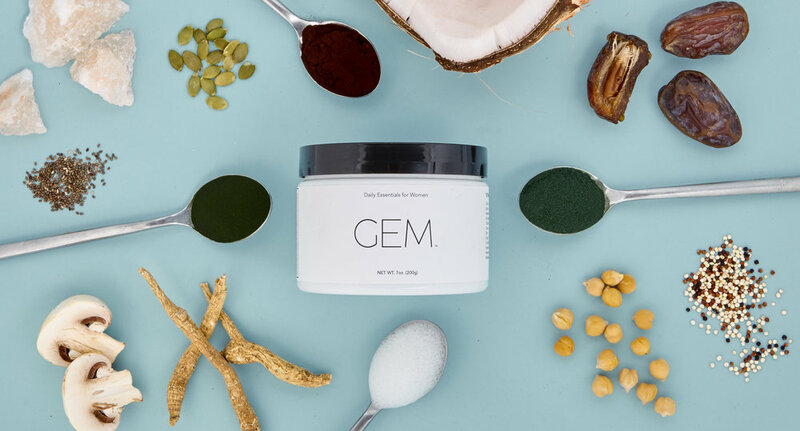 Biotin, red algae, and omegas make up the beauty trio in each bite of GEM. 90% of our customer base said they experienced clearer skin and stronger hair & nails. Continuing to grow and empower a community of women to feel their best.